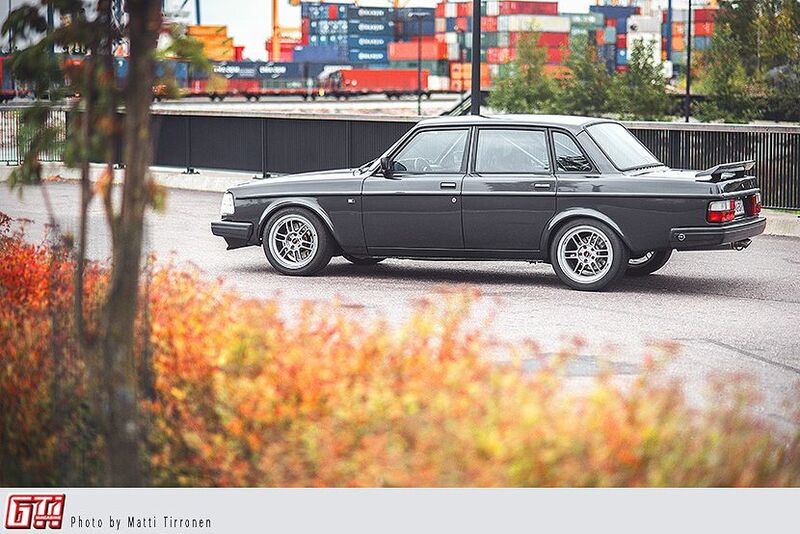 This Volvo 240 GL, which is owned by Lauri Likonen, looks like a well maintained classic. That's until you see it shredding tires or look a little deeper into its specification sheet. This car has seen a total revival, but instead of using OEM parts, it was built from scratch to withstand 550 mighty horses. The project took almost four years to finish, but it was time well spent, to say the least. 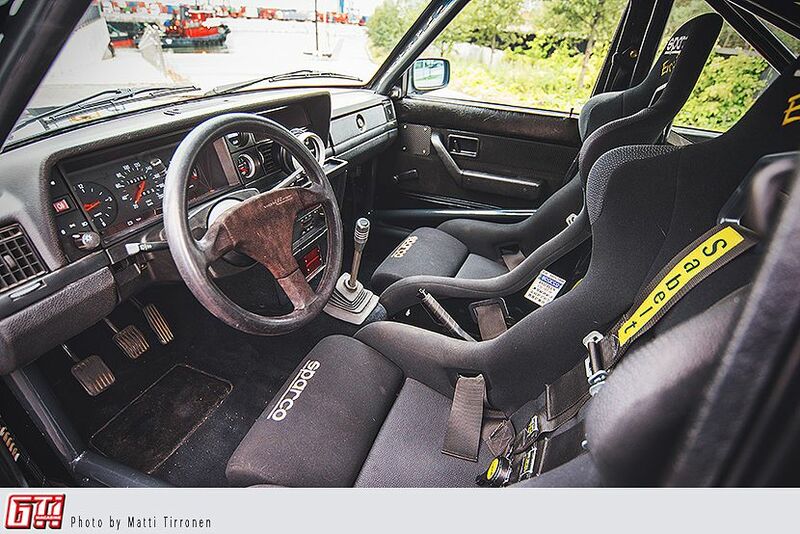 Lauri Likonen has had six Volvos before this one, and several other cars as well, despite his young age. He bought this one in August of 2012, as it looked like a well-maintained individual and was supposed to be a good canvas on which to build a project car on. It had a few visible soft spots, but what was supposed to be a few fun nights welding turned out to be a chore lasting six months, since the car was full of surprises and rot. Well, at least now the car is pretty much recreated from nil, and at the same time Lauri remodeled the rear arches to house bigger wheels. Since the project had already started escalating, Lauri decided to jump in the deep end with this project. The original plans to create a 400hp sleeper had already changed to plans more grandiose, so it was time to install a roll cage. This was delegated to Ode and his father, who both have a long history in manufacturing quality cages. Lauri measured, designed and modelled the cage himself, though. The Sparco EVO 2 Plus bucket seats were installed after the roll cage, which means that they naturally didn't fit, and the almighty angle grinder sung its people's song once again. The original beige interior was swapped to a black interior to match the gloomy exterior. The door cards weren't available in black, so Lauri just painted them. The gear shift lever is a DIY, since the ZF320 gearbox is from a BMW M3, and the original didn't fit. During the total overhaul most of the suspension was built anew, and all the remaining original parts were sandblasted. Everything deemed unnecessary was simply thrown away. 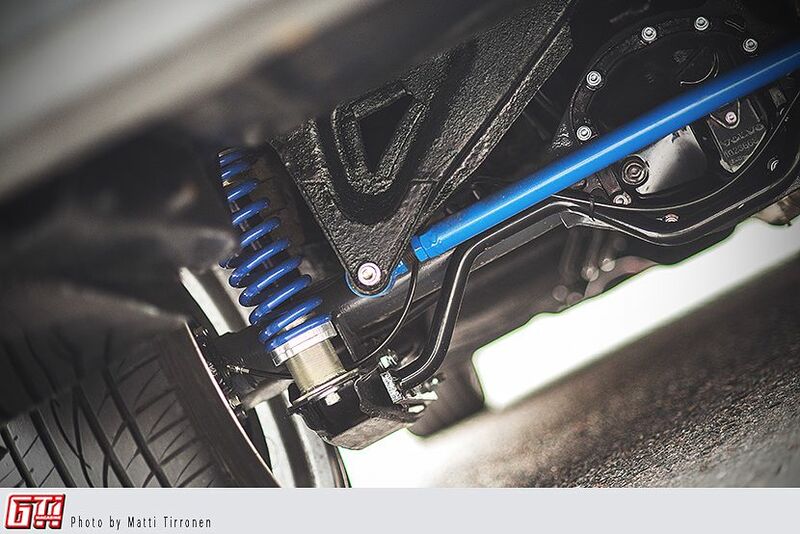 The stock suspension is not what you'd call trackworthy, so a DIY coilover project using parts from quality manufacturers was put into action, and some parts were modified by notable racing companies. Adjustable coils, support arms and an IPD panhard were installed, among other pars, and all the stock bushings were replaced with Powerflex bushings. This Volvo looks brand spanking even from underneath, and no stone was left unturned whilst breathing new life into its aged chassis. The rear diff houses a Detroit Truetrac, which is a well known cure for that god-awful one tyre burnout. While this eight-valve head was machined by Kansiset, Lauri built the exhaust header from a 42mm pipe and TIG-welded it with Faabio. The header was coated first with VHT header primer, and then with a ceramic paint. Finally it was wrapped with DEI Titanium wrap, so that should take care of any heat radiation. 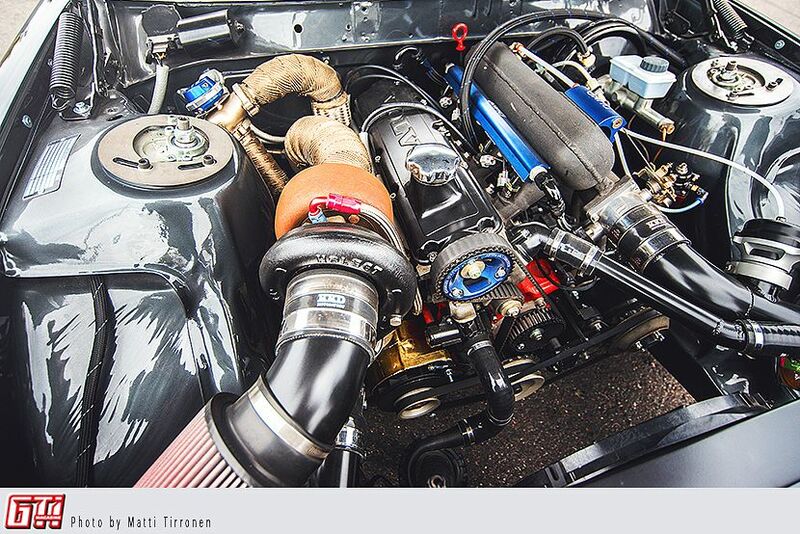 KL-Racing's 400x350x102 intercooler, a Griffin radiator and Setrab's 12-row oil cooler should also help with heat problems, and cool air is brought into the air intake by a vent in the co-driver's side. The engine management is a Vipec, since Lauri's friend also has one, so tuning help was near. All the electric wirings were removed and reinstalled, and the installation was done so that you only see the bare minimum of the wirings. 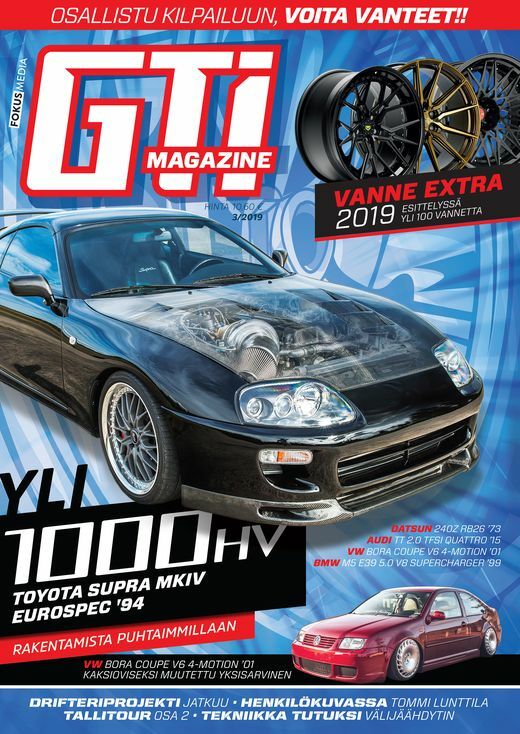 The modification list is pretty impressive, and so are the results: 546 hp and 596Nm in a car like this should make any car enthusiast grin like an idiot. The trunk was modified a lot to house all the luxury items seen in the picture. 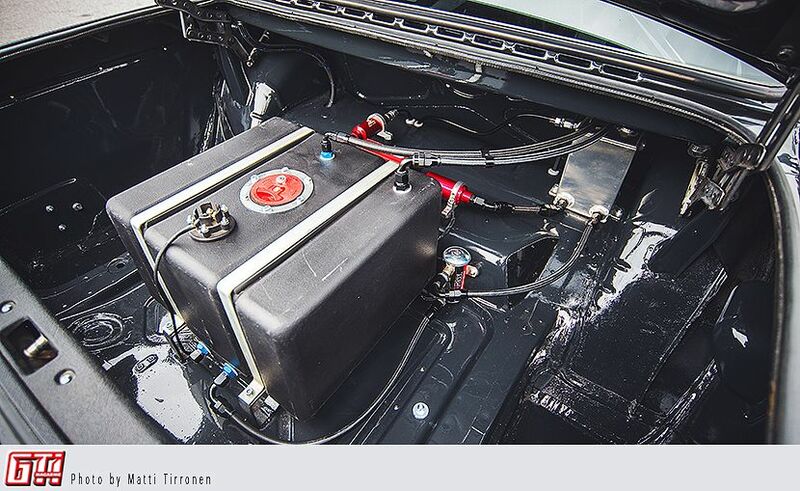 A JAZ safety fuel cell was installed in a cradle modified just for it, and a Facet Red Top pump delivers fuel to the three liter aluminium swirl pot. Aeromotive A1000 fuel pump pumps E85 to the hungry EV14 2000cc injectors like a true people's champion, and the pressure is controlled by Aeromotive's fuel pressure regulator installed in the engine bay. The fuel line from the trunk to the firewall in the front is aluminium pipe by Aeroflow, and the rest is AN8 sized teflon hose with a black nylon coating. Neat. 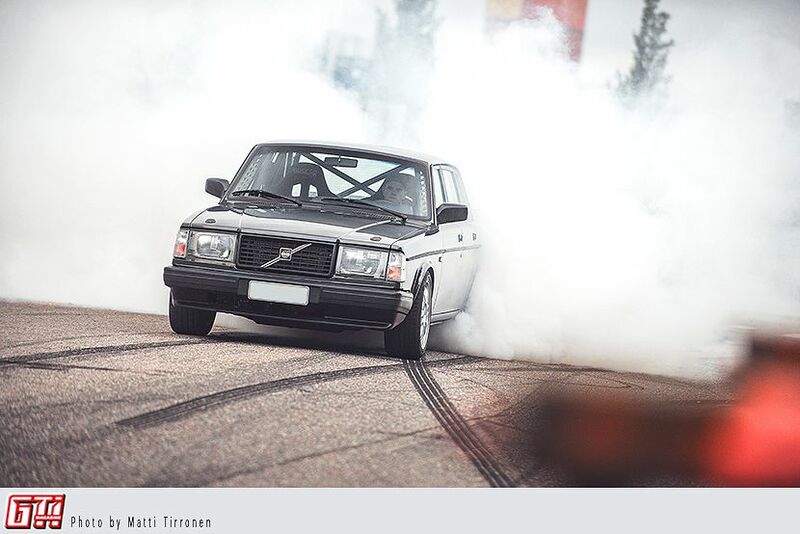 The car was finally painted with Volvo's original dark gray metallic paint. A Group-A style rear spoiler was ordered from Sweden, the front lights were restored and the reflectors were painted black. All the blinkers were swapped to bright ones, and all the chrome decors were swapped to black ones. All this monochrome and darkness makes the car somewhat menacing, which it of course also is. The wheels are Enkei RPF-1's, and along with the huge brakes they are pretty much the only thing that give you a hint of this car's sporty nature, if you don't pay any attention to the roll cage inside. Well, any doubt of its character should be stripped the instant the storm pedal is pressed, since the noise made by a 3.5” exhaust with a single muffler and a Holset HX40 Super should give rather obvious clues even to a dead person.